The Bay of Fundy is a UNESCO Biosphere Reserve. 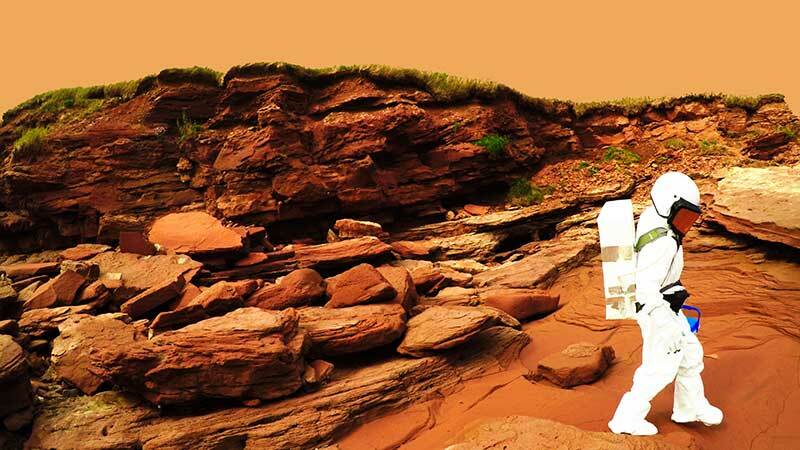 Its tides can reach 17 meters high and its red soil is reminiscent of Mars. As 2019 marks the 50th Anniversary of the Apollo program, we set out to explore this living laboratory, to weigh the relevance and beauty of our planet. While familiarizing ourselves with the essence of places, we are drawn toward human interaction within environments, the mystery, and dynamics created through the appearance of, and actual states of change over time. We began a concentrated exploration of the Fundy Biosphere and surrounding areas during the summer 2017. Our visits to sites continued throughout the seasons as we recorded images and sound, took notes and began to write the texts that are now included in the video program. In mid-December 2018, we began to edit. Looking through the lens of changing atmospheric conditions and the evolution of human inroads to pristine environments, our aim has been to create videopoetries that showcase current conditions and possible futures of the areas we examine. As artists and writers, we use a holistic approach while moving through encapsulated worlds. The Bay of Fundy is known for its 50-foot tides, reputed to be the largest in the world. While clamoring around its iron rich (red) sedimentary rock, we began to imagine ourselves within the Martian landscape. Fossil sites dating from the Jurassic time period also lent themselves to imagining the Bay of Fundy during other time periods. Learning that July 2019 marks the 50th anniversary of the Apollo 11 moon landing and the famous quote: ” … one small step for a man, one giant leap for mankind,”  we decided to combine our own voyages to capture the spirit of places in and surrounding the Fundy biosphere with this out-of-world historic event. In order to construct within all of that beauty and the scale of Fundy’s nature, we decided to literally place ourselves into the role of astronaut explorers, to find relations to the actual and imagined landscape. Overall, the videos intend to comment on the value of our planetary home.